Starting out studying Graphic Design in school, Nova knew she loved creating, precision, and art. After a few years trying to satisfy her creativity with design, she accepted the fact that sitting at a computer was not going to be her path. For as long as she can remember, working with her hands has come as a natural and instinctive process. From making dough ornaments in her craft corner as a child, to working in her gardens, and on to her passion for creating jewelry from the raw materials of metal, stones and whatever other material sparks her imagination. She loves pattern, especially the patterns found in natural objects. Nature can often be thought of as random and chaotic, but if a closer look is taken, it is very ordered. Pattern is an endless inspiration that can develop and grow in so many different directions. Much of her inspiration comes from her garden, where she can spend hours looking, touching, and watching the continuum of the natural system. 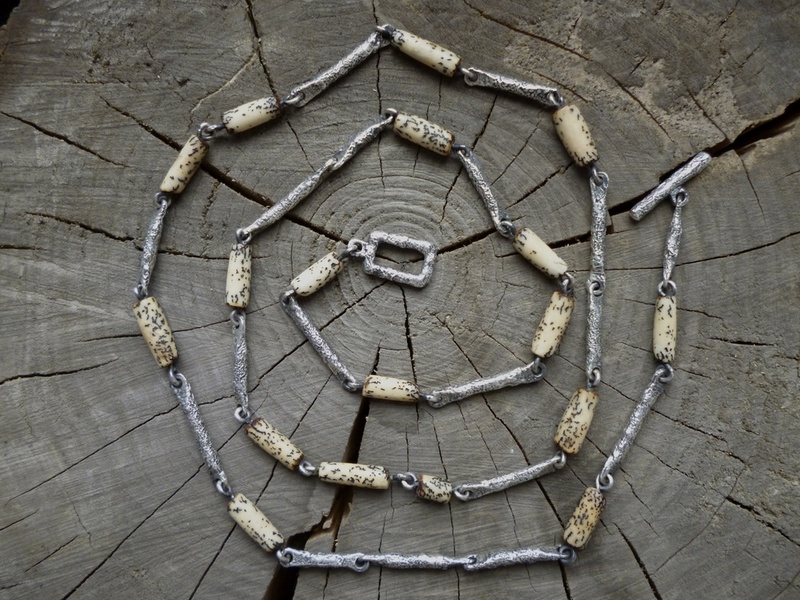 As much as her own tastes vary, so do the pieces she creates: from the streamlined precision of inlaying different metals in her marriage of metal work, to the random patterns of the rough edge series. This diversity helps balance out the creative process, letting her both control the metal and allow the metal to take form the way it wants. It also keeps her thinking and growing, in all directions, in all aspects of life. Nova’s goal is to create jewelry that is not only unique, but also very wearable. For her, it isn’t about having a piece that can only be worn on a night out, but being able to wear it working and playing. She enjoys making this way because for her, there isn’t a reason why everyday jewelry has to be predictable. So much of life is spent doing those things we have to do, that we shouldn’t save being interesting for special occasions, when every day is special.